We focus on force-free and positive techniques to build happy, confident dogs that know how to behave without being asked. 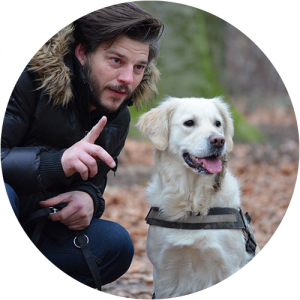 We help you to expand your knowledge and skills, equipping you with all you need to get the most out of your dog. We are qualified, accredited and insured for your peace of mind. We tailor every session to the individual owner and dog. Behaviour and training sessions from the comfort of your own home across Edinburgh and the Lothians, any time, any day of the week. Are you facing any of these issues with your dog? 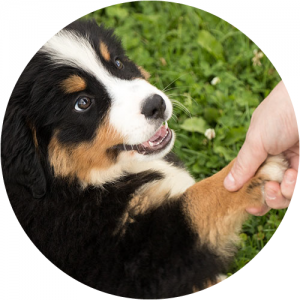 Arguably the most important part of your dog’s development occurs in those critical first few weeks. Whilst many classes focus on obedience at this stage, we have other ideas. Yes! You can teach an old dog new tricks! Whatever the age, whether you’re training just for fun or would like your dog to pay more attention to your commands, we have the tips, tricks, and training methods to get you on the right track. Looking for a bespoke dog walking service to meet the needs to your reactive dog? We offer regular, individual walks, respite walks (for when you just need a break!) 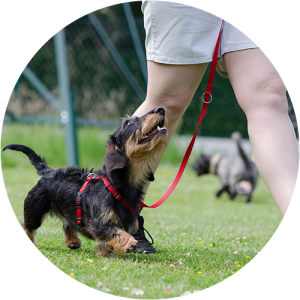 and training walks for dogs with special requirements. [River] is extremely knowledgable and without doubt the dogs benefited from her understanding of dog behaviour. She got the best out of the dogs and I would highly recommend. Highly recommended. River was patient and understanding, and gave me all the tools and info needed to get Archie on the right track. Understanding his behaviour and knowing how to respond makes a world of difference. River is absolutely brilliant! Help me a lot and gave me so much knowledge on dog behaviour! Loved working along side River helping dogs in need of some behaviour training. She has helped so many dogs in the the Edinburgh dog and cat home. Definitely recommend River to anyone that is looking for a behaviourist. Thank you! Having had a dog with a lot of problems and having taken advice from many people River was amazing, all too often it seems some people watch a few episodes of a tv show and think they can be paid for handing out really bad outdated information. River's knowledge is outstanding and I doubt I would have been able to bring my border collie round if it wasn't for her expert advice and coaching now I feel confident with my pooch in almost all settings. Thank you. Amazing dog behaviourist I have ever worked with, you have gave me more confident to understanding my dog and his behaviour alot more than I did before and gave me all the support I need, i feel like I can come to you about anything regarding my boy (Rudi) without feeling like am being judged. Rudi is getting more confident day by day and it's all thanks to you. Thank you so much River, it's always a pleasure working with you as we have fun with Rudi in the process. Looking forward to seeing [you] again soon on our next session.